Eco-cup is a reusable menstrual cup hygienic, easy to use, manufactured in Italy in 100% medical grade silicone. Available in 2 sizes and 3 colors (clear, blue and fuchsia). 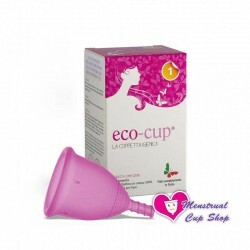 Eco-cup is an Italian menstrual cup produced in strict accordance with European standards UNI EN ISO10993-1: 2010 and USP Class VI. • Stem easily adaptable to the physical conformation. With small circles well defined to facilitate gripping. 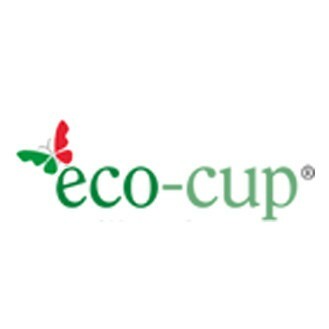 Eco-cup is available in two sizes. The two sizes have the same length, but different diameters. -Size 1 (small) : women up to 30 years who have not had children with natural childbirth. -Size 2(large) : for women over 30 years or with heavy menstrual flow or who have had children with natural childbirth. Eco-cup comes in a box with a cotton bag and instructions in English, Italian and Spanish. Eco-cup has a medium stiffness. Eco-cup is a short cup of easy opening. Ideal for begginers and also for women who look for a short cup in excellent material.